Captain Cuttle. Dombey and Son by Charles Dickens. Home » Captain Cuttle. Dombey and Son by Charles Dickens. 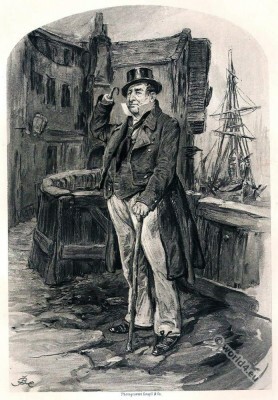 A GENTLEMAN in a wide suit of blue, with a hook instead of a hand attached to his right wrist; very bushy black eyebrows; and a thick stick in his left hand, covered all over (like his nose) with knobs. He wore a loose black silk handkerchief round his neck, and such a very large coarse shirt collar, that it looked like a small sail. Charles Dickens’s Novel “Dombey and Son.” Frederick Barnard, Artist. This entry was posted in 1848, 19th Century, England, Genre, Victorian period and tagged Character sketches on 6/30/15 by world4.